I don't know his name. I barely even remember what he looked like, but certainly he was friendly. Without him, this whole marathon thing I do might have evaporated on that hot March day. I think he was black not that it matters. Certainly, from what he did, he must have measured 5 or 6 inches more than my 5'8" height. Whatever his name, whatever his profession or nationality (I think he was American), he came along at just the right time. Let's call him The Dark Knight. The day had started full of promise. 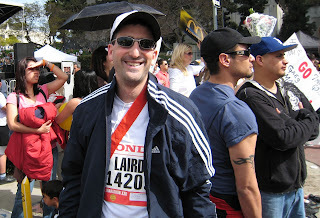 My first marathon, in my home town of Los Angeles, amongst 15,000 other runners. My stepson Justin drove me to the start in Universal City. I took pictures with Spider-man and Shrek (coincidental since I was working on games based on both characters), and my training felt solid. My bib number was pinned to my running shirt, and my electronic timing chip affixed to my right shoe. This was my big day. After starting to run in February 2006 and loving my first 5k on July 4, 2006, I worked my way up to a half-marathon in November of the same year. Encouraged by running friends (particularly friend, co-worker and fellow runner Kim), I decided I could attempt a marathon. This had been on my bucket list although at the time I don't think I actually knew the term. Initially, I had given some thought to running my first marathon in Fort Collins, Colorado in May 2007. But not knowing how the altitude would effect me and having 4 months from the half-marathon to the LA Marathon, I decided to tackle the earlier but less logistically challenging race. 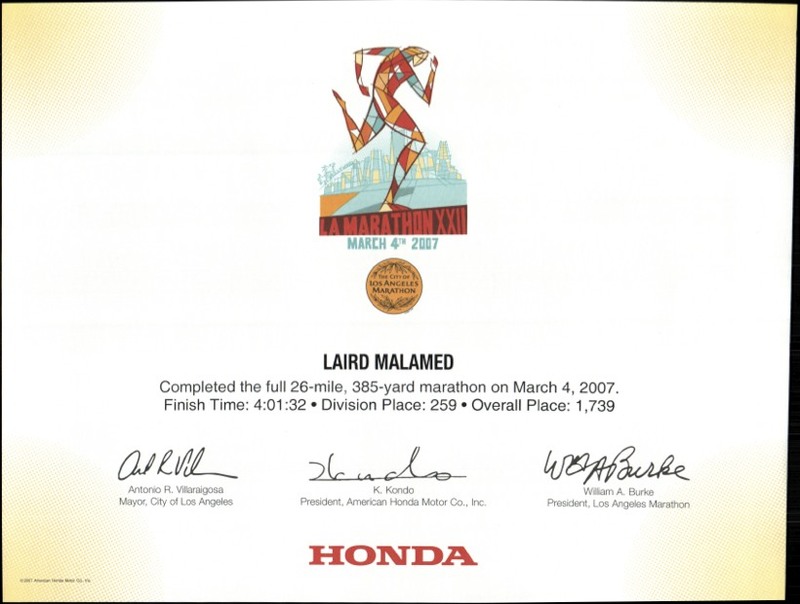 The LA Marathon at that point was about 25 years old. It started after the 1984 LA Olympics with great fanfare. The original course began and ended at the Memorial Coliseum after a trip through Downtown and to Hollywood and back. That course featured some pretty tough hills and underwent various revisions over the years. 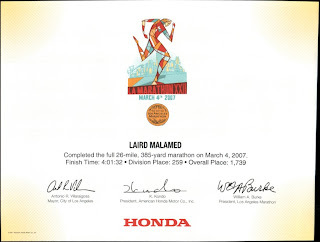 By the time I ran in 2007, the course started near Universal Studios, came over the Cahuenga Pass, down through Hollywood to Exposition Blvd, then east around the Coliseum and USC, traversing up into Boyle Heights at mile 20 and back to downtown to finish near Staples. If that sounds like a good course, then I have misdescribed it. The 10 miles from Hollywood to the Coliseum were long straight streets with minimal crowd support and very little to see. In short, boring. In 2007, the marathon start was easy to handle. Ample parking near Universal City allowed Justin to walk me to the starting area. There was little security and no real rush for bathrooms or water. But it was warm. For 6:30 AM, it was actually hot - maybe 65 degrees already. That did not bode well. I prepared for cooler weather and had planned to lose my sweatpants during the race. But that was when I thought it would be 50 degrees to start. I handed all my outer clothing to Justin before he left to go home. And mistakenly, I left him holding my water bottle. But as I started the race and realized there was no turning back for the agua, I knew I would have to pay attention to hydrating. The race began well. While the first part was uphill to get over the pass, that was the hardest portion of the course until the Boyle Heights climb at mile 20. And the first half zipped by. I dutifully got water every mile and munched my gels I carried in my pockets. I think back to what I have learned since then and just smile. But runners say nothing really can prepare you for your first marathon. Due to the spareness of the course, for some reason, there was a sparseness of porta-potties too. Or I missed them for something like 6 miles. And by the time I found one near the Coliseum, I really had to go. I guess I had been good about those water stops. Yet now it was almost 80 degrees. This would be the warmest LA Marathon in years, and I was likely running too fast for my training which had been done mostly near the cool air of the ocean. Boyle Heights just crushed me which was sort of unfortunate given my grandparents had grown up there. I think I even passed near where they had lived. I had been looking forward to that part, but I shuffled through in a haze. By the time I reached mile 25 and the last stretch into downtown, I was walking. Slowly. I knew I could scamper through the finish in about 20 minutes. And if I had been much further away, I likely would have quit. But knowing I would complete the race, I put my head down and trudged on through the pain. Everything hurt, particularly my quadriceps - likely from the food in my pockets banging against them as I ran. (I soon found shorts with pockets in the back - www.raceready.com - 100% recommended.) When would it all be over? Then I could call myself a marathon finisher and get on with the rest of my life. So in this dazed, slightly self-loathing state, promising myself I would never, ever run a marathon again, along comes Dark Knight dude. He zips up beside me and puts a hand on my hat. Giving it a gentle shake from side to side, he simply says "Come on buddy." And then he takes off for his sub-4 hour finish. (I finished in 4:01, so he must have beaten 4 hours.) Maybe the whole encounter took 8 seconds. But my spirits lifted. And I started to run again. I owed it to the Dark Knight. Coming through the chute, I felt like a million bucks. I had beaten my first marathon and all the misery of mile 25 was gone. Mr. Dark Knight had given me just the right amount of encouragement and just the right time. I thank him for his kindness, and I have found that runners in general are a friendly group of people. I think one reason I like to run is for the camaraderie of the events. The first requirement after the finish line was to have the timing chip removed from my shoe to avoid a $25 fee. A team of volunteers stood near small wooden boxes with scissors in hand to snip the cable ties holding the chip in place. Smiling like the winner of the greatest title fight in the world - my personal rumble in the jungled streets of LA - I deftly lifted my foot into position. The volunteer, a kindly woman of about 60, returned my smile. I am guessing she had snapped off hundreds of chips already. Still smiling, she simply stated, "Other foot please," for my jumbled brain had of course put forth the wrong shoe. Justin and Rebecca met me after the finish. Rebecca snapped a picture which you will see doesn't look that bad. Rebecca tells me I however didn't look that good. Yet, in the span of 20 minutes, I had promised my body that this was the only marathon I would do and then reversed that promise and committed myself to running another one within six months and to then qualify for Boston. I did obtain both goals in the next year, but by then I had found out about running the 7 continents. More on that in the Continent 2 post.